For other uses, see Busan (disambiguation). Busan (Korean pronunciation: [pusan]), formerly known as Pusan and now officially Busan Metropolitan City, is South Korea's second most-populous city after Seoul, with a population of over 3.5 million inhabitants. It is the economic, cultural and educational center of southeastern Korea, with its port—Korea's busiest and the fifth-busiest in the world [a]—only about 120 miles (190 km) from the Japanese islands of Kyushu and Honshu. The surrounding "Southeast Economic Zone" (including Ulsan and South Gyeongsang) is now South Korea's largest industrial area. Busan is divided into 15 major administrative districts and a single county, together housing a population of approximately 3.6 million. The full metropolitan area, including the adjacent cities of Gimhae and Yangsan, has a population of approximately 4.6 million. The most densely built-up areas of the city are situated in a number of narrow valleys between the Nakdong and the Suyeong Rivers, with mountains separating most of the districts. The Nakdong is Korea's longest river and Busan's Haeundae Beach is also the country's largest. Busan is a center for international conventions, hosting APEC in 2005. It is also a center for sports tournaments in Korea, having hosted the 2002 Asian Games and FIFA World Cup. It is home to the world's largest department store, the Shinsegae Centum City. Busan was added to the UNESCO Creative Cities Network as a "City of Film" in December 2014. Paleolithic remains found in the Jung-dong district and Jwa-dong district in Haeundae shows a history of Busan beginning in the prehistoric age. In addition, neolithic relics were discovered in shell mounds in Dongsam-dong, and a shell mound dating between the BCE era to the 3rd Century A.D. was found in the Dongnae district. Mt Geochil (Geochilsan-guk) is recorded as a chiefdom of the Jinhan Confederacy in the 2nd–4th centuries. It was absorbed by Silla and organized as a district (gun). The grave goods excavated from mounded burials at Bokcheon-dong indicate that a complex chiefdom ruled by powerful individuals was present in the Busan area in the 4th century, just as Korea's Three Kingdoms were forming. The mounded burials of Bokcheon-dong were built along the top of a ridge that overlooks a wide area that makes up parts of modern-day Dongnae-gu and Yeonje-gu. Archaeologists excavated more than 250 iron weapons and ingots from Burial No. 38, a wooden chamber tomb at Bokcheon-dong. From the beginning of the 15th century, the Korean government designated Busan as a trading port with the Japanese and allowed their settlement. Other Japanese settlements in Ulsan and Jinhae diminished later, but the Busan settlement continued until Japan invaded Korea in 1592. After the war, diplomatic relations with the new shogunate in Japan were established in 1607, and Busan was permitted to be reconstructed. The Japanese settlement, though relocated into Choryang later, continued to exist until Korea was exposed to modern diplomacy in 1876. In 1876, Busan became the first international port in Korea under the terms of the Treaty of Ganghwa. During the Japanese rule, Busan developed into a hub trading port with Japan. Busan was the only city in Korea to adopt the steam tramway before electrification was introduced in 1924. 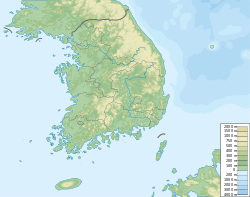 During the Korean War, Busan was one of only two cities in South Korea not captured by the North Korean army within the first three months of the war, the other being Daegu. As a result, the cities became refugee camp sites for Koreans during the war. As Busan was one of the few areas in Korea that remained under the control of South Korea throughout the Korean War, for some time it served as a temporary capital of the Republic of Korea. UN troops established a defensive perimeter around the city known as the Pusan Perimeter in the summer and autumn of 1950. Since then, the city has been a self-governing metropolis and has built a strong urban character. In 1963, Busan separated from Gyeongsangnam-do to become a Directly Governed City (Jikhalsi). In 1983, the provincial capital of Gyeongsangnam-do was moved from Busan to Changwon. In 1995, Busan became a Metropolitan City (Gwangyeoksi). Busan is located on the Southeastern tip of the Korean Peninsula. It is located on the coast, which determined the development of the whole city itself. It is the nearest of South Korea's six largest cities to Japan. The distance as the crow flies from Busan to Tsushima Island, Nagasaki Prefecture, Japan, is about 49.5 km (31 mi), to Fukuoka, Japan, about 180 km (112 mi), and by contrast, to Seoul about 314 km (195 mi). Busan borders low mountains on the north and west, and the seas on the south and east. The Nakdong River Delta is located on the west side of the city, and Geumjeongsan, the highest mountain in the city, on the north. The Nakdong River, South Korea's longest river, flows through the west and empties into the Korea Strait. 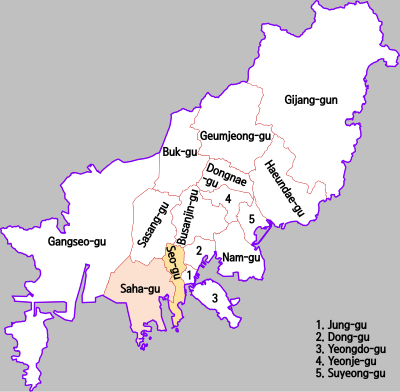 The southeastern region, called Yeongnam in Korea, encompasses both Gyeongsang Provinces and 3 metropolitan cities of Busan, Daegu and Ulsan. Ulsan lies northeast of Busan. Combined population exceeds 13 million. Located on the southeasternmost tip of the Korean Peninsula, Busan has a cooler version of a humid subtropical climate (Köppen climate classification Cwa). Extremely high or low temperatures are rare. The highest temperature ever recorded is 37.3 °C (99.1 °F) on 14 August 2016 while the lowest temperature ever recorded is −14.0 °C (6.8 °F) on 13 January 1915. May to July, late Springs and early Summers, are usually cooler than inland regions because of the ocean effect. Late Summer, and early Autumn, August and September, are generally hot and humid and the city may experience typhoons at that time and be generally rainy. On September 15, 1959, Super Typhoon Sarah passed by the coast of the city and caused catastrophic damage. An unusually severe storm on September 12, 2003, Typhoon Maemi, also caused damage to ships and buildings and resulted in over 48 fatalities. October and November are generally the most comfortable, with clear skies and pleasant temperatures. Winters are cold and comparatively dry with high winds, but much milder than other parts of Korea except Jeju-do and several islands off the southern coast. Busan and the nearby area has the least amount of snow compared to other regions of Korea due to its location. Snow falls on an average of only about 5 days per year. Even a little accumulation of snow can effectively shut down this seaport city because of the hilly terrain and unfamiliarity of motorists with driving on snow. Busan is the 2nd largest city in Korea, a maritime logistics hub in Northeast Asia with its world-class mega ports, and a gateway to the Eurasian continent. In 2017, the maritime city recorded a GRDP of US$758.4 billion with a per capita GRDP of US$22,000. The city's economy is made up of the service industry (70.3%), manufacturing (19.8%), construction (5.9%), agriculture & fisheries (0.8%), and other sectors (3.2%). Moreover, Busan is also a center of finance. Korea Exchange (KRX), Korea's sole securities exchange operator, is headquartered in Busan. The city is home to a number of financial institutions, such as the Korea Technology Finance Corporation, Korea Asset Management Corporation, Korea Housing-Finance Corporation, Korea Housing & Urban Guarantee Corporation, Korea Securities Depository, Korea Maritime Guarantee Insurance, Maritime Finance Center, The Korea Shipping and Maritime Transportation Co., Ltd, Korea Asset Management Corporation, and BNK Financial Group. Commercial areas are dispersed throughout the city near busy intersections and adjacent to university campuses, but the two largest central business districts in Busan are Seomyeon and Gwangbok-dong/Nampo-dong. There are also four substantial shopping areas of note: Seomyeon, Gwangbok-dong, Busan Daehak-ga in Jangjeon-dong, and Centum City in Haeundae-gu. Seomyeon is the crossroads of Busan. The local subway station serves two lines and is one of the busiest in the city. Seomyeon subway station is also home to a large number of underground shops, selling a variety of products, predominately clothing and footwear. These are small boutique shops, selling locally produced products. The local head offices of Korean and international banks are located in Seomyeon. It is recognized as the ascendant shopping and entertainment district. It is also home to "Seomyeon Medical Street", the district encompassing the 1 km-radius range around Lotte Department Store in Seomyeon and the Buam subway station. The Street is home to a total of 160 cosmetic and other medical clinics, including those specializing in cosmetic surgery, dermatology, ophthalmology and dentistry. Directly adjacent to Seomyeon is Bujeon Market, the largest traditional market in the city. The Gwangbok-dong, Nampo-dong, and Jungang-dong areas form the old central business district. Some of the restaurants in this district use family recipes passed down the generations. Jagalchi Market, a large seafood market, is located in this area. The Gukje Market is also nearby. Jungang-dong is the home of many international law offices, the old Immigration Office, and the international ferry terminal serving Japanese routes. Lotte World II is currently under construction along the water between Jungang-dong 7-Ga and 8-Ga.
Centum City, an industrial complex, is a popular new shopping area with luxury department stores. Busan has many major department stores, including Lotte Department Store (located in Seomyeon, Centum City, Gwangbok-dong and Dongnae), Lotte Premium Outlet (in Gimhae and Gijang), Shinsegae Premium Outlet (in Gijang), as well as large supermarket chains across the city, such as Home Plus, E-mart, and Costco. Busan's major 5-star hotels include; The Westin Chosun Busan, Paradise Busan, and Park Hyatt Busan. In 2017, the 7-star Hilton Hotel and Ananti Cove resort opened in the Osiria Tourism Complex, Gijang-gun district, drawing a number of guests from home and abroad. Busan not only features a variety of antique and souvenir shops, but also unique restaurants, attractions and accommodations. Nampo-dong is a central shopping and café district. The area around Pukyong National University and Kyungsung University also has many cafés, bars, and restaurants attracting college students and youth. Busan is called the summer capital of Korea since it attracts tourists from all over the country to its six beaches. Luxury hotels and a carnival boardwalk line the beach at Haeundae. Gwangalli Beach has cafés, bars, and restaurants along the beach, and the Grand Gwangan Bridge. Other beaches include Dadaepo Beach on the west edge of the city and Songdo Beach, which is south-central. Haeundae Beach is one of the most famous beaches in Korea. There is also a film, Tidal Wave (2009) based on the location about a tsunami hitting Busan. Geumjeongsan to the west is a weekend hiking spot for Busan residents. To the north, the neighborhoods around Pusan National University (also known as PNU, which is one of the most highly recognized national institutes of higher education in Korea) have student theaters, cafés, bars and restaurants, as well as open-air cultural street performances on weekend nights. Nearby is Beomeosa, the city's main Korean Buddhist temple. Yongdusan Park occupies 69,000 square meters/17 acres (7 ha) and is home to the Busan Tower, Yongdusan Art Gallery, and the Busan Aquarium, the largest aquarium in South Korea. The park supports approximately seventy different species of trees and is a tourist destination, with various cultural events throughout the year. Dongnae-gu is a wealthy and traditional residential area. Dongnae Oncheon is a natural spa area with many baths, tourist hotels, restaurants, clubs and shopping areas. Many restaurants in the area use family recipes. Chungnyeolsa is a Confucian shrine for soldiers who died during the 16th century battle against the Japanese at Dongnae Fortress. Taejongdae is a natural park with cliffs facing the open sea on the island of Yeongdo. The area known as the "Foreigners' Shopping Street", but commonly referred to as "Texas Street" near part of the Port of Busan, and adjacent to the front entrance to the Busan Train Station (부산역) has many businesses that cater to the local Russian population, as well as the crews of foreign ships. The area was originally the location of the local Chinatown and still contains a Chinese school. Haedong Yonggung temple is one of three sacred places related to the Goddess Buddha. It is located right next to the sea. It lies on a mountain in the front and the sea at the back. Busan Citizens Park (formerly Camp Hialeah) is a former Imperial Japanese Army base and United States Army camp located in the Busanjin District. Dongbaek island Dongbaek Island is located at the southern end of Haeundae Beach. The island creates a picturesque scene in harmony with a thick forest of camellias and pine trees. Tourist attractions on Dongbaek Island include a walking path and the Nurimaru APEC House, built for the 2005 APEC summit. Huinnyeoul Culture Village Huinnyeoul Culture Village was created when Korean War refugees flocked to this area. It provides an unhindered view of both the Busanhang and Namhang Ports. A major backdrop of the acclaimed Korean movie, ‘The Attorney’, the neighborhood was also featured in yet another Korean hit, ‘Nameless Gangster: Rules of Time’. The small houses that stand shoulder to shoulder form the signature look of Busan, which is often remembered as a city of the sea and hilly neighborhoods. The village continues to attract an increasing number of visitors with its new cafes, workshops, and guesthouses. Millak Waterfront Park : Millak Waterfront Park is the first waterfront park in Korea, which combines the oceanfront with public leisure facilities. The park is located between Haeundae Beach and Gwangalli Beach. The waterfront park, with an area of 33,507m² , can accommodate as many as 40,000 visitors. The floor of the park is decorated with colorful blocks, and the park provides visitors a perfect chance to relax, and features flower gardens, gazebos, and benches. If you sit on the 3,040–wide stand, you can dip your feet in the water during high tide. 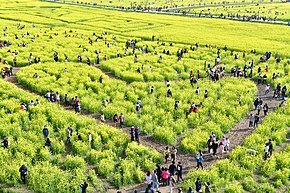 Daejeo Ecological Park: With a length of 7.62 km (4.73 mi) and a size of 2.66 km2 (1.03 sq mi), designated as Natural Monument No. 179, Daejeo Ecological Park is a habitat for migratory birds at the Nakdong River Estuary. The estuary was chosen as a trial project for the Four Major Rivers Restoration Project. The sports facilities were partially built on the upper and lower parts of the park only, while the rest of the park underwent a restoration of its wetlands and natural grassland. In the garden inside the park, you can find a large-scale habitat for prickly water lilies, which are part of the Endangered Species Level II classification. Many interesting festivals, such as the Nakdong Riverside Cherry Blossom Festival, the Busan Nakdong River Canola Flower Festival, and the  Daejeo Tomato Festival are held around this park every year.Ilgwang Beach : Ilgwang Beach is long white-sand beach, extending for about 1.8 kilometers, and is particularly popular among families with young children as a vacation spot because the waters are quite shallow. Every summer, the Gaetmaeul Outdoor Drama Festival is held on this beach. The festival features diverse performances of traditional Korean music, outdoor dramas, mime shows, and other performance art forms. Kiswire Museum(F-1963) : Kiswire Museum(F-1963) offers its visitors a chance to better understand wire, a key material for industrial development, and central to Kiswire's corporate philosophy. The museum won The 2014 Busan Architecture Award for its aesthetic design. In addition, the roof of the museum is supported by only 38 cables without any pillars or beams, which makes the museum quite unique. In addition, the museum features special art pieces, including artwork made with wires. Jeonpo Café Street : Seomyeon, Busan is busiest area with a variety of entertainment, restaurants and shops. Across Seomyeon 1 Beonga (Seomyeon 1st Street), the busiest street in the area, there is a quiet and tranquil street with about 30 unique cafés. Several years ago, the Bujeon-dong and Jeonpo-dong areas were full of hardware stores and machine part suppliers. However, since 2010 the area has been transformed into a trendy street full of cozy and hip cafés. Most of the coffee shops are small cafés ran by individual owners. Such cafés offer the chance to enjoy a variety of coffee beans and flavors. Busan hosts the Busan International Film Festival (BIFF)—one of the most popular international film festivals in Asia—at the Busan Cinema Center every fall. It is also the home of the Busan Biennale, an international contemporary art biennale which takes place every two years. The city also hosts the One Asia Festival, the largest K-pop festival in Korea beginning in 2016, positioning itself as the center of K-pop culture. In 2012, German artist Hendrik Beikirch painted Asia's tallest mural entitled“Fisherman Portrait” on a building near Millak Raw Fish Town. Busan is home to 80 performance facilities consisting of 30 public ones, including the Busan Cultural Center, Busan Citizens’Hall, Busan Cinema Center, and Busan National Gugak Center. There are 40 private facilities, such as KBS Art Hall Busan, Sohyang Art Center, MBC Samjoo Art Hall, Kyungsung University Concert Hall, and Shinsegae Department Store Culture Hall. Busan was once a center of military affairs in the southern region of the peninsula and therefore was an important site for diplomatic relationships with Japan; high-ranking officers and officials from the court frequently visited the city. Special foods were prepared for the officers such as Dongnae pajeon (동래파전), a variant of pajeon (Korean savory pancakes), made with whole scallions, sliced chili peppers, and various kinds of seafood in a thick batter of wheat flour, glutinous rice flour, eggs, salt and water. During the Korean War, Busan was the biggest refugee destination on the peninsula; people from all regions of Korea went there. Some of these refugees stayed and adapted and adjusted the recipes of their local specialties. One of these foods is milmyeon (밀면) (lit. 'wheat noodle') a version of naengmyeon, cold buckwheat noodle soup, but using wheat flour instead. (Naemyeon is originally a specialty food of Hamhung and Pyongyang, now part of North Korea.) Dwaeji gukbap (돼지국밥) (lit. 'pork/pig soup rice') is also a result of Korean War. It is a hearty pork soup and is becoming more popular nationwide. Pork trotters served with vegetables such as cucumbers, onions, and mustard sauce is popular and is called Nangchae-Jokbal. We can find a trace of authentic Busan in the popular fishcakes at the Bupyeong Market. Fishcakes originally came from the Japanese food "Kamaboko". It is made of crushed and fried fish fillets. Busan's fishcakes have gained their reputation from their special taste. More and more people are taking food trips to Busan to taste the special fishcakes. Around 1 million travelers honor this food's history by visiting one of the famous local fishcake stores. The history of Choryang Galbi (pork ribs) goes back to the Korean War. Back then, ordinary people gathered in the town of Choryang to have relatively cheap, but nutrient-packed pork ribs to decompress from a long day of work. Still today, around 20 galbi restaurants uphold its history and Choryang has become famous for its galbi street. If you visit Busan, you must try the raw sliced mackerel. Around 80% of all mackerel in Korea are caught in Busan. Mackerel can easily spoil, so it is best to eat raw right after it is caught. Visitors should try the food and enjoy its fresh and delicious taste. Busan has the largest hot spring resorts and facilities in Korea. Busan's Oncheon is the oldest hot spring spa in Korea. It even has its own unique history, where long ago an old man with aching legs was said to have seen an injured crane come to the hot spring and bath in it. After bathing in its waters, the crane became completely cured and happily flew away. Upon seeing this, the old man also bathed his aching legs in the water and was cured. Among the hot spas, ‘Dongnae Oncheon’ and ‘Haeundae Oncheon’ are the most famous ones. Today, the spas have an outdoor bath and sauna. According to the census of 2007, of the people of Busan 41.9% follow Buddhism and 16.6% follow Christianity (12.1% Protestantism and 4.5% Catholicism), 39.9% of the population is mostly not religious or follow other indigenous religions. The city planned to bid for the 2020 Summer Olympics, but withdrew after the 2018 Winter Olympics were awarded to Pyeongchang, also located in South Korea. The 2020 Summer Olympics were eventually awarded to Tokyo. It is currently considering bidding to host the 2032 Summer Olympics. Since 1982, the city has been home to the Lotte Giants, who play in the Korea Professional Baseball league. In Korea, Busan is known as the capital of baseball and has a reputation for very enthusiastic baseball fans. For the first few years, the Lotte Giants utilized Gudeok Baseball Stadium as their home. In the mid-1980s, they moved to Sajik Baseball Stadium, which was built as part of a sports complex for the 1986 Asian Games. The city is home to a K League football club, the Busan IPark. The club was formerly known as the Buan Daewoo Royals and was a successful team during the 1990s. Busan is also home to a National League football club, the Busan Transportation Corporation. Busan is home of the Korean Basketball League team Busan KT Sonicboom, which plays in Sajik Arena. Thoroughbred horse racing is held at Busan-Gyeongnam Horse Racing Park every weekend. Bicycle Racing is held at "Busan Cydrome," the velodrome in Geumjeong Sports Park, every weekend. The 2002 FIFA World Cup was the world's 17th FIFA World Cup, held from the 31st of May to the 30th of June 2002 at locations in South Korea and Japan. Busan hosted matches between France and Uruguay, and ROK against Poland at the Busan Asiad Stadium. The 2002 Asian Games were held in Busan, ROK, from September 29 to October 14, 2002. 9,900 athletes from 44 countries competed in 38 sports. Many public sports complexes, university gymnasiums, including Busan Asiad Stadium were used for the games’ venues. The mascot was a seagull, the city bird of Busan named, “Duria”. East Timor took part in the games for the first time. As well, North Korea also participated for the first time in an international event held in South Korea. The 2020 World Team Table Tennis Championships, the ITTF announced on the 1st of May in Halmstad, Sweden that Busan won the bid to host the 2020 World Team Table Tennis Championships. The Championships will be held in March 2020 at BEXCO, with 2,000 athletes from 130 countries participating. Busan celebrates festivals all year round. Busan has many hospitals and clinics. Many cosmetic surgery, dermatological, ophthalmic, dental clinics are concentrated in Seomyeon medical street. Hospitals in Busan include Pusan National University Hospital with 1,300 beds in Ami-dong, Kosin University Gospel Hospital with 957 beds in Amnam-dong, Dongnam Institute of Radiological & Medical Sciences specializing in cancer treatment with 298 beds, Dong-A University Hospital with 999 beds in Dongdaesin-dong, Dong-eui Medical Center with 468 beds offering cooperative western and oriental medicine treatment in Yangjeong-dong, Inje University Busan Paik Hospital with 837 beds in Gaegeum-dong, Inje University Haeundae Paik Hospital with 896 beds in Jwa-dong, Busan Medical Center with 555 beds in Sajik-dong and Busan Veterans Hospital in Jurye-dong, Sasang-gu. In particular, Seomyeon Medical Street, which first started construction in the Bujeon-dong area beginning in 1990, has formed a cluster of more than 230 medical institutions, full of expertise, that is difficult to find in other parts of the world. The “Seomyeon Medical Street Festival” has taken place annually since 2012. Major express bus lines link Busan with other cities in Korea at two primary bus terminals, Nopodong Bus Terminal (at the northern terminus of Subway Line 1) and Seobu Bus Terminal at Sasang Station on Subway Line 2. City buses operate a total of 160 routes. There are express buses connecting major areas quickly through tunnels and overpasses and general city buses which make stops at each bus stop. There are also airport buses connecting the Gimhae International Airport and the downtown area. Some of the city buses of Busan's adjacent cities including Yangsan, Changwon, Gimhae and Ulsan also offer service to Busan. Gimhae Airport Limousine Bus is one of the fastest buses connecting Gimhae International Airport and the downtown area. As of 2012, three routes are operated by Taeyoung Airport Limousine Corp.
Intercity buses to east Gyeongnam, Gyeongbuk, Gangwon and Gyeonggi Provinces are available at the Busan Central Bus Terminal. Buses offering service to West Gyeongnam and Jeolla Province depart from the Busan West Bus Terminal located in Sasang. Buses to the east Gyeongnam area, including Ulsan, Gimhae and Changwon, the Seoul Metropolitan Area, including Osan, Suwon, Ansan, Bucheon and Dong Seoul and the southern Gangwon area, including Donghae and Gangneung are available at the Haeundae Intercity Bus Terminal. The Dongnae Intercity Bus Terminal has buses to the central and southern Gyeongnam area, including Changwon, Gimhae, Gosung, Tongyoung, and Geoje, as well as to Suncheon, Yeosu and Gwangyang. Ferries leaving from the International Ferry Terminal at Busan Port Pier 3,4 connect Busan to the Japanese ports of Izuhara and Hitakatsu on Tsushima Island, as well as the cities of Shimonoseki, Fukuoka, and Osaka on Japan's mainland. PanStar operates the PanStar Ferry between Busan and Osaka. The Seaflower 2, the ferry to Tsushima operated by Dae-a Express Shipping, carries passengers only between Busan and Hitakatsu in 1 hour 40 minutes and between Busan and Izuhara in 2 hours 40 minutes. The Seonghee, operated by Pukwan Ferry, links Busan to Shimonoseki. One of the ferries to Fukuoka is the Camellia, operated by Camellia Line. The Camellia makes the trip to Fukuoka overnight in 7 hours 30 minutes, and trip back in the afternoon in 5 hours 30 minutes. The other ferry service to Fukuoka is assumed by the Beetles and the Kobees, 2 fleets of high-speed hydrofoils operated by Miraejet. About five departures from each city are scheduled every day. By hydrofoil it only takes 2 hours 55 minutes to cross the Korea Strait to Fukuoka. The Beetles are owned by JR Kyushu. This is administered by the Busan Port Authority. Busan lies on a number of rail lines, of which the most important is the Gyeongbu Line which connects it to other major cities such as Seoul, Daejeon, and Daegu. All classes of trains run along the Gyeongbu Line, including the superhigh speed KTX trains which provide frequent services to Seoul in approximately 150 minutes. The Gyeongbu Line terminates at Busan Station. Other lines include the Donghae Nambu Line which connects Ulsan, Pohang and Gyeongju. SRT first launched in 2016 and runs along the Gyeongbu and Honam high-speed railways. SRT offers a new gateway connecting the Gangnam area of Seoul with major cities. It is directly connected to Subway Line 3 and the Bundang Line, enhancing accessibility to Subway Line 2, 5 and 8, as well as the Shinbundang Line, and it is also located near the Dongbu Expressway that connects to other major highways. The Gimhae International Airport Domestic Terminal in Gangseo-gu provides flights to Gimpo, Jeju and Yangyang. The Gimhae International Airport in Gangseo-gu operates routes to Japan (Tokyo, Nagoya, Osaka, Fukuoka, Sapporo and Kitakyushu), China (Beijing, Shanghai, Shenyang, Qingdao, Weihai and Yantai), Hong Kong, Macao, Taiwan (Taipei), Mongolia (Ulaanbaatar), Germany (Munich), Vietnam (Hanoi, Ho Chi Minh and Da Nang), Thailand (Bangkok), the Philippines (Manila, Cebu and Calibo), Malaysia (Kuala Lumpur, Kota Kinabalu), Cambodia (Siem Reap), Laos (Vientiane) and Guam. Flights to Narita International Airport in Tokyo make easy transfer to North America possible. Busan shares the title of sister city with several coastal cities or provinces around the world. As of May 2018, Busan has 10 friendship cities in six countries. 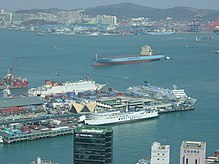 The Port of Busan also has 6 sister ports (listed in order of dates). ^ It is the 9th busiest in the world by cargo tonnage. ^ This name is also encountered as "Pusan City" (Pusan-si) and "Pusan Directly-Administered City" (Busan-jikhalsi or Pusan-chikhalsi). ^ "Pusan-gwangyŏksi: South Korea". Geographical Names. Retrieved 2011-08-15. ^ "Busan Population 2018". World Population Review. 17 December 2017. Retrieved 11 August 2008. ^ "Cargo processed at Busan port dips 6.5 pct in Oct". Yonhap News. 2016-11-24. Retrieved 2017-01-10. ^ "Largest Department Store - Guinness World Records Blog post - Home of the Longest, Shortest, Fastest, Tallest facts and feats". Community.guinnessworldrecords.com. 2009-06-29. Retrieved 2011-09-15. ^ "Busan city on UNESCO's Creative Cities Network main page". Yonhap News Agency. Retrieved 2018-10-03. ^ "The origin of the name Busan" (in Korean). Busan City. Archived from the original on 3 May 2012. Retrieved 4 January 2012. ^ "Pusan: South Korea". Geographical Names. Retrieved 2011-08-15. ^ "Pusan-si: South Korea". Geographical Names. Retrieved 2011-08-15. ^ "Pusan-jikhalsi: South Korea". Geographical Names. Retrieved 2011-08-15. ^ "Pusan-chikhalsi: South Korea". Geographical Names. Retrieved 2011-08-15. ^ "Korean National Identity under Japanese Colonial Rule". ^ "The History of Korean Railway by Photographs". ^ a b 기후자료 극값(최대값) 전체년도 일최고기온 (℃) 최고순위, 부산(159) (in Korean). Korea Meteorological Administration. Retrieved 10 January 2017. ^ a b 기후자료 극값(최대값) 전체년도 일최저기온 (℃) 최고순위, 부산(159) (in Korean). Korea Meteorological Administration. Retrieved 10 January 2017. ^ a b "Climatological Normals of Korea" (PDF). Korea Meteorological Administration. 2011. p. 499 and 649. Archived from the original (PDF) on 7 December 2016. Retrieved 10 January 2017. ^ 평년값자료(1981–2010) 부산(159) (in Korean). Korea Meteorological Administration. Retrieved 10 January 2017. ^ "Area and Number of Administrative Units". Statistics Korea. Retrieved 2017-01-10. ^ "South Korea - Largest Cities". ^ 부산시, 제1회 서면메디컬스트리트 축제 개최 | 뉴스와이어. Newswire.co.kr. Retrieved 2013-03-12. ^ "World Tourism Summit and TPO Forum 2008". Worldtourismsummit.com. 2005-11-14. Retrieved 2011-09-15. ^ "· International School of Busan". International School of Busan. ^ "Busan Foreign School". busanforeignschool.org. ^ "Welcome to FAU Busan Campus - German University in Korea". fau-busan.ac.kr. ^ "Busan Itinerary 2 Days". ^ "Official Site of Korea Tourism Org. : Yongdusan Park". Visitkorea.or.kr. Retrieved 2011-09-15. ^ "Chungnyeolsa Introduction(충렬사소개)". Busan Metropolitan City. Retrieved 2011-12-11. ^ "Welcome to the United Nations Memorial Cemetery!". 26 May 2012. Archived from the original on 26 May 2012. ^ Asia's Tallest Mural by Hendrik Beikirch. Yatzer (2012-09-10). Retrieved on 2013-07-12. ^ "Museum of Contemporary Art Busan Opens to the Public". Haps Magazine. 20 June 2018. Retrieved 11 August 2018. ^ Inman, Jung (7 July 2017). "Korean Films Get the Spotlight at New Museum". Busan ddadang. Retrieved 11 August 2018. ^ "Kiswire Museum and Training Center". Architizer. Retrieved 11 August 2018. ^ [내고장 이 맛!] 부산 동래파전. Seoul.co.kr. Retrieved 2011-09-15. ^ Kim Gi-hyeon (김기현) (2009-05-13). 동래파전·돼지국밥…음식도 관광자원으로 (in Korean). Munhwa Ilbo. ^ Lee Gyeong-taek (이경택) (2002-09-26). 부산AG 장외 음식열전 (in Korean). Munhwa Ilbo. ^ Noh, Ju-Seok (노주석) (2009-07-29). 영도다리/노주석 논설위원 (in Korean). Seoul Sinmun. ^ 서울에서 `빵 뜬` 부산 명물 먹을거리 Best 4. mk.co.kr (in Korean). Retrieved 2018-04-28. ^ People's Daily Online (2005-11-14). "Pusan to declare bid to host 2020 Olympic Games". Retrieved December 8, 2006. ^ "24 HOUR NEWS CHANNEL ::::: YTN (와이티엔)". YTN. Retrieved 2011-09-15. ^ 부산문화관광축제조직위원회. bfo.or.kr. Retrieved 2018-08-01. ^ "The 31th Polar Bear Swim Festival". bear.busan.com. Retrieved 2018-08-01. ^ "Joseon Tongsinsa HIstory Museum". tongsinsa.com. Retrieved 2018-08-01. ^ 2018 부산국제연극제. 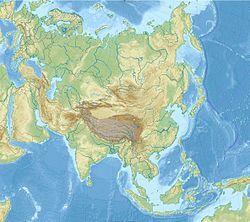 bipaf.org. Retrieved 2018-08-01. ^ 아트부산 2018. artbusankorea.com (in Korean). Retrieved 2018-08-01. ^ BIKY. 제13회 부산국제어린이청소년영화제. 제13회 부산국제어린이청소년영화제 (in Korean). Retrieved 2018-08-01. ^ "Haeundae Sand Festival (해운대 모래축제) | Official Korea Tourism Organization". english.visitkorea.or.kr. Retrieved 2018-08-01. ^ 아시아송 페스티벌2017. asiasongfestival.com. Archived from the original on 2017-09-25. Retrieved 2018-08-01. ^ ::빠르고 정확한 인터넷 의협신문::. Doctorsnews.co.kr. Retrieved 2011-09-15. ^ "Pusan National University Hospital". .pnuh.co.kr. Archived from the original on 2011-07-20. Retrieved 2011-09-15. ^ "Inje University Paik Hospital". Paik.ac.kr. Retrieved 2011-09-15. ^ 동아대학교의료원 홈페이지에 오신것을 환영합니다. Damc.or.kr. Retrieved 2011-09-15. ^ "Kosin University Gospel Hospital". Kosinmed.or.kr. Retrieved 2011-09-15. ^ 부산성모병원. Bsm.or.kr. Retrieved 2011-09-15. ^ "Dong-Eui Medical Center - Busan, Korea". Demc.kr. Archived from the original on 2010-10-20. Retrieved 2011-09-15. ^ 침례병원. wmbh.co.kr. Archived from the original on 2000-12-04. Retrieved 2011-09-15. ^ "Busan Medical Center". Eng.busanmc.or.kr. Archived from the original on 2012-09-24. Retrieved 2011-09-15. ^ 메리놀병원. Maryknoll.co.kr. Retrieved 2011-09-15. ^ 인제대학교 부산백병원 - 환자중심의 병원, 내집처럼 편안한 병원. Paik.ac.kr. Archived from the original on 2011-10-15. Retrieved 2011-09-15. ^ "Dongnam Inst. Of Radiological". Dirams.re.kr. 2013-01-29. Archived from the original on 2013-02-19. Retrieved 2013-03-12. ^ PanStar Ferry Archived February 9, 2008, at the Wayback Machine, Korean operator of the ferry linking to Osaka, Japan. ^ (in Korean) Dae-a Express Shipping, operator of the ferry linking to Tsushima Island, Japan. ^ Pukwan Ferry, operator of the ferry linking to Shimonoseki, Japan. ^ Kobee and Beetle, ferries linking to Fukuoka, Japan. ^ "How To Go To Busan From Seoul By Flight, Train, Bus And Car". ^ "Barcelona internacional – Ciutats agermanades" (in Spanish). Ajuntament de Barcelona. Archived from the original on 2009-02-16. Retrieved 2009-07-13. ^ "CÁC ĐỊA PHƯƠNG NƯỚC NGOÀI ĐÃ THIẾT LẬP QUAN HỆ HỮU NGHỊ HỢP TÁC VỚI TPHCM" (in Vietnamese). mofahcm.gov.vn. October 9, 2010. Retrieved January 8, 2011. "Corea" , 'Encyclopædia Britannica, 9th ed., Encyclopædia Britannica, 9th ed. , New York: Charles Scribner's Sons, 1878, pp. 390–394 . Overkamp, Sven (2009), "Selected Materials on Korean from the Siebold Archive in Bochum", BJOAF (PDF), Vol. 33, pp. 187–216 . Wikimedia Commons has media related to Busan. 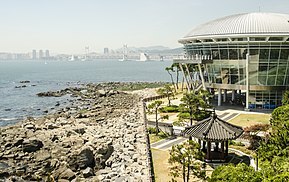 Wikivoyage has a travel guide for Busan.